If nothing else, Kurt Tank, the main designer at Focke-Wulf, was a man who anticipated things. While production of the Fw-190 was underway, he was also working on a high altitude version of the aircraft. At this same time, the RLM was looking for a way to intercept the high altitude bombers that the Allies were sure to develop. Current fighters just were not capable of performing that task. 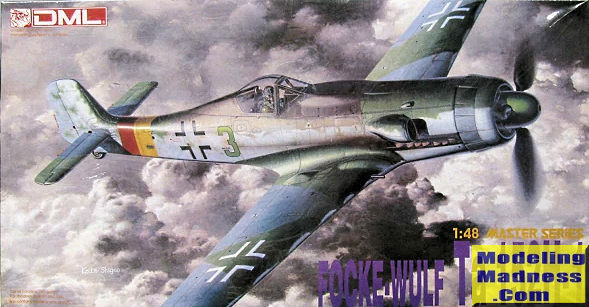 The RLM put for the proposal during 1942, asking both Messerschmitt and Focke-Wulf to come up with designs. Messerschmitt offered the Me-155, and Tank offered something based on the current Fw-190. Well, as luck would have it, Messerschmitt had nothing but problems with the -155 and had to turn over development to Blohm und Voss, as other projects kept him from working on it. Tank, on the other hand, was able to produce functioning prototypes using the Jumo 213 engine by late 1944. In fact, Tank envisioned a whole series of aircraft, including a low level fighter, a fighter-bomber and high altitude interceptor. The Ta-152C (the aircraft was given the Ta designation vice Fw in honor of Kurt Tank who designed it), was built in very small numbers, the fighter-bomber wasn't built at all, so most 152s were the high altitude version. The Ta-152 H-1s were all initial production aircraft and, as far as I can tell, not conversions of various other 190s. They look exactly like the pre-production H-0 variants. There is no external way to tell them apart other than serial numbers. The H-1 had extra fuel tanks in the wings which were not installed in the H-0. Ta-152Hs were all assigned to one unit, JG 301, or kept as test aircraft. Those test aircraft were informally organized into Jagdstaffel Ta152. Often they were flown with only on-board fuel and didn't have the drop tank attached. It had superb speed and the ability to out run and out maneuver almost everything in the sky. It is a shame for the Germans that it came along so late (only entering unit service in January 1945) as it was easily the best piston-engined fighter that the Luftwaffe had. Thanks to the deteriorating war situation, Ta-152 production ceased after fewer than 50 airframes (including prototypes) had been built. Dragon certainly made a splash with this one when (as DML), they released this kit in 1991 as their first 1/48 aircraft kit. It eventually led to a number of 190 and 152 variant kits and were touted as the best there ever was (which up to that time was true). Not only was it the first mainstream kit of this aircraft in this scale, but it had several features beloved by modelers. First thing you notice is that it comes with an engine. While one can skimp on some of the details, the main block and mounts are needed so you have something to hold the prop. It also allows for a complete accessory section to be added to the kit. Previous 152 kits used standard FW-190 wheel wells, which were closed. Not so the 152. Since you have a full engine, the kit provides separate cowling pieces though you have to cut away the ones on the fuselage halves. If you wish to display the engine alone, a stand is provided. Even if you decide to model the plane without the panels open, you still need the engine to hold the prop and accessory section. Separate exhaust are provided, one to mount on the engine or alternately ones to install in the closed cowlings. Cockpit is fairly well done, though there doesn't seem to be any interior sidewall detail. The kit includes a photo etch fret that provides a seat harness, head armor, area behind the pilot that is under the canopy, an intake screen, radio bits, exhaust shield (to keep hot air out of the supercharger intake) and some other small pieces. The wings include a spar and are standard single piece lower with separate upper halves There is good wheel well detail. Landing gear is nicely done and if one is modeling the kit gear down, the main gear doors will require trimming. There is no centerline mount or tank provided. The cowling front is modeled with the cowl flaps. Prop assembly has separate blades. The canopy is the later blown style with solid head rest. The only markings option shown is the box art plane with JG 301 though you are provided with a selection of aircraft numbers to use if you so wish. Decals are nicely done, though being 26 years old, I'm not sure how well they will work. Instructions are excellent with Gunze paint references as well as lots of detail drawings to assist with your build. I'm not sure how accurate the kit really is, but I don't recall hearing the usual fussing and whining when kits do not meet expectations. One thing for sure, it will require careful building as DML 190s were all a bit difficult to assemble. 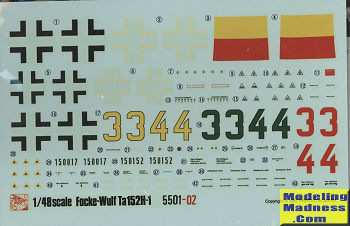 I should also point out that the decal sheet has no swastikas so you'll need to get those from another source. As far as I know, this has been eclipsed by the Z-M offering of a few years back. However, it is still a very nice kit and can easily be found for less than the other so if you want a nice kit for not a ton of money, you should seek out this one from various vendors.